Cut down on the garbage with environmentally friendly holiday cards. Sending organic holiday cards is a great way to spread the message of environmental responsibility, along with holiday cheer and wishes for a prosperous new year, to your friends and family members. There are many different ways to make sending Christmas cards better for the environment. One unique solution for sending environmentally responsible cards is to select greeting cards printed on paper embedded with seeds. Botanical Paperworks carries a full line of holiday greeting cards and other paper products printed on handmade plantable paper. Recipients can simply plant the cards you send according to the included instructions. The seeded paper will quickly sprout and turn into wildflowers, spruce trees, or other terrific green additions to the interior or exterior of the recipients' homes. When shopping for Christmas cards, check to see what type of paper was used to print the cards. 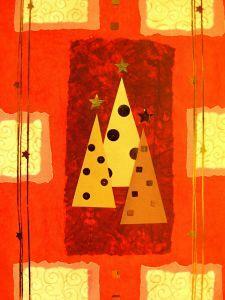 Many companies offer holiday greeting cards printed on recycled card stock. For example, Greenfield Paper converts the junk mail it receives throughout the year into post consumer pulp and makes 100 percent recycled Christmas cards from it. Choosing cards printed on tree-free paper, such as kenaf, is a good way to send organic holiday cards. If you aren't familiar with kenaf, see Vision Paper for information about this amazing organic fiber that eliminates the need for cutting down trees to make paper. Peaceful Valley Greetings, an online resource for a variety of different organic products, carries a full line of Christmas cards printed on tree-free paper. It can become a fun tradition to reuse Christmas cards from year to year. If you still have last year's cards, you might want to consider sending each card back to its original sender, with a personal note penned inside the card. Encourage the recipient to do the same for you next year. Not only can this be environmentally responsible approach to sending holiday greeting cards, it can also be a much more meaningful activity than sending generic cards out to everyone on your list. There are other options for keeping old Christmas cards from ending up in landfills after just one use. Instead of re-sending last year's Christmas cards to the people on your holiday greeting list, you can create ornaments, gift tags, small gift boxes, and framed Christmas prints with them. You can use recycled or tree-free paper to create your own custom holiday greeting cards. Most office supply stores and organic gift shops carry full selections of environmentally responsible stationery and card stock. You can easily use a desktop publishing application to create your Christmas cards, or you can even hand-letter your holiday greeting messages. You can also create collages of holiday images on recycled paper by using seasonal pictures cut out of old Christmas cards or magazines. Electronic holiday cards are transmitted via email. Sending electronic cards is a great environmentally friendly way to spread seasons greetings messages to everyone on your holiday list. Sending e-greetings is both economical and conservation minded. Email holiday cards don't require paper, ink, or stamps, and they don't have to be delivered via the postal service. Being a steward of the environment doesn't require giving up the tradition of sending holiday greeting cards to your friends, relatives, customers, and other contacts. It just means that you need to choose greeting cards wisely, paying attention to the materials from which they are made and the manner in which they are manufactured. By sending organic holiday cards, you can actually help raise awareness of the many options to traditional paper products.